This weeks showcase Historic Home of St Paul is 629 Summit Avenue. 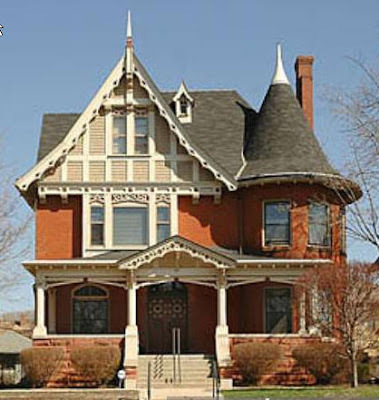 Built in 1896, this whimsical home was built for William Kirke and his wife by the famous Clarence Johnston. Johnston is known for having designed over 30 homes on Summit Avenue alone. Another home stood on this site from 1873-1893. The doors are one of a kind and help give it my pet name for the home,”The Witches House“. There is just something mystical about the details in the home. For instance the tower roof looks like a witch’s black hat, at least to me. As far as architectural design, the home is built in the Gothic Style. The gingerbread trim and the high pitched front gable help distinguish the style from a Queen Anne home. While it is hard to tell what exterior elements have changed over the years as I was not able to find any old photographs of the home, the shape of the home, the porch, the bracketed eves, and the tiny wood details, make me think that previous owners loved the home and kept it’s historical significance intact. This beautiful Summit Avenue home was recently sold for $1.09 Million. It has approximately 5700 square feet, 5 bedrooms, 4 bathrooms, and also a third story apartment. 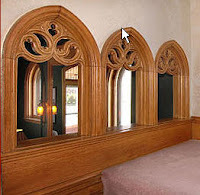 Wood carvings and stained glass windows add interest to the home, as do the large dining room and parlor rooms original to the home.